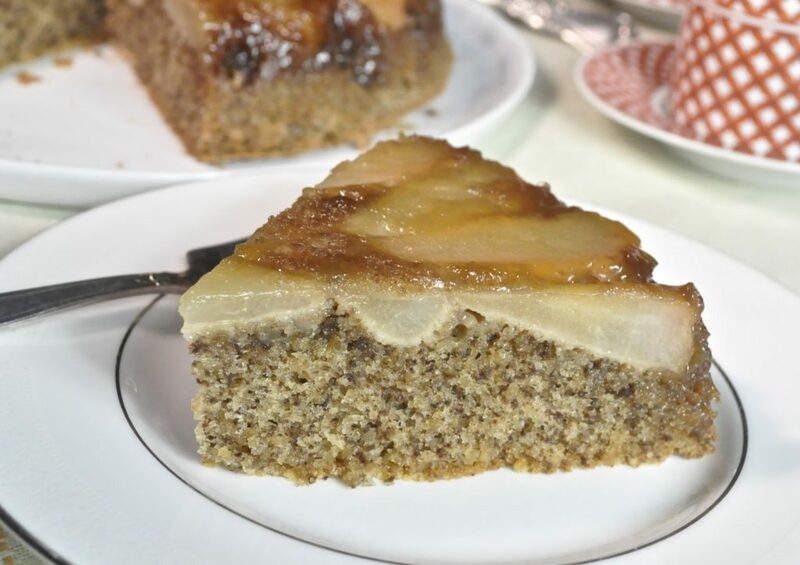 Seriously, I had to make this cake, if only because I wanted to use some of those delicious boxed pears sent to us for Christmas by our friends Jan and Dave. We still had five uneaten pears left in the box, despite having had a houseful of family and visitors over the holidays. Yes, of course we could have just eaten them raw, but when you have a husband whose idea of the perfect wedding vow includes a commitment to provide cake each night, well, you try to obey (No, neither the cake nor the obey part was part of the vows). Truth be told, I was longing to make this dessert since I saw it being whipped up on the TV program, “America’s Test Kitchen” recently. And with ample pears in the house, it was good timing. 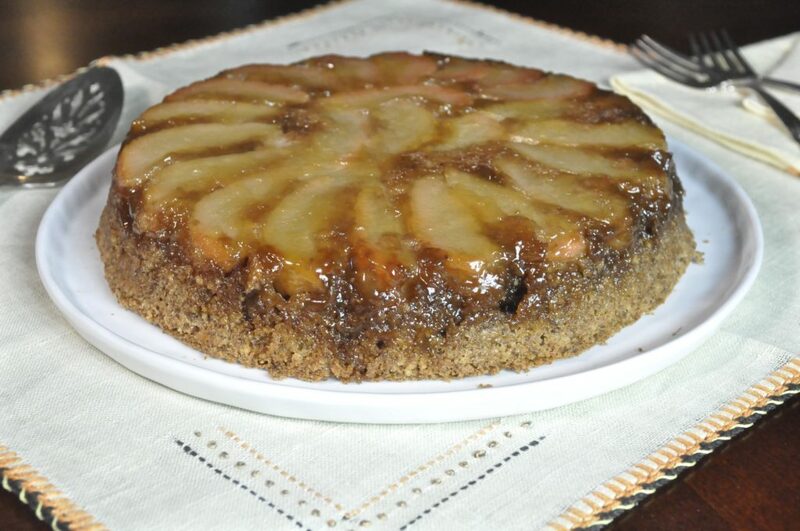 I’ve made a lot of upside down cakes in my life, from my childhood favorite, pineapple upside down cake, to peach, to cranberry, to plum, to fig, to blood orange. All of them are made with a basic white or yellow cake, but this one is very different. It does use a little white flour, but it’s got one dominating ingredient that gives the cake a distinct look and flavor. Maybe now you can, after seeing this cut slice. It’s toasted walnuts, giving the cake a delicious walnut-y flavor. It’s also very moist with a delicate crumb. And it’s easy to make too – using a food processor instead of a mixer. The only thing missing is perhaps a little whipped cream or creme fraiche. If you want to be really wicked, maybe a scoop of ice cream. Oh what the heck, go for it. Bathing suit season doesn’t start for a while. Pour melted butter over bottom of pan and swirl to evenly coat. Combine sugar, cornstarch, and salt in small bowl and sprinkle evenly over melted butter. Set aside 1 pear half and reserve for other use. Cut remaining 5 pear halves into 4 wedges each. 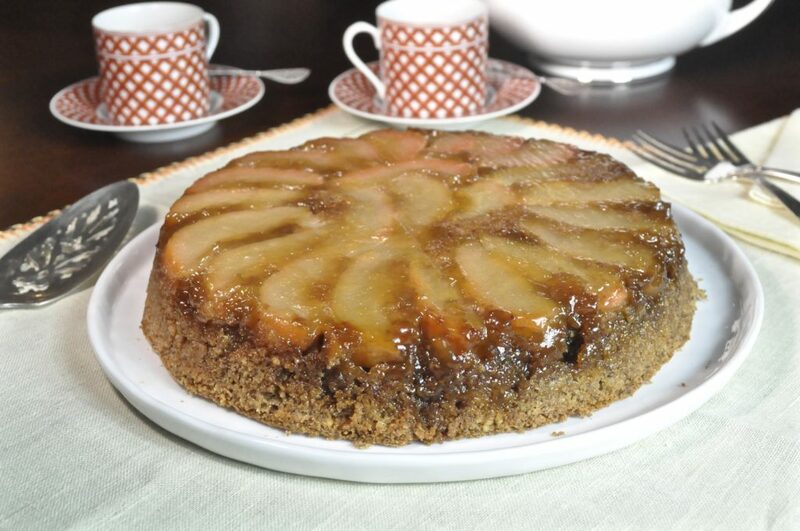 Arrange pears in circular pattern around cake pan with tapered ends pointing inward. Arrange two smallest pear wedges in center. Pulse walnuts, flour, salt, baking powder, and baking soda in food processor until walnuts are finely ground, 8 to 10 pulses. Transfer walnut mixture to bowl. Process eggs and sugar in now-empty processor until very pale yellow, about 2 minutes. With processor running, add melted butter and oil in steady stream until incorporated. Add walnut mixture and pulse to combine, 4 to 5 pulses. 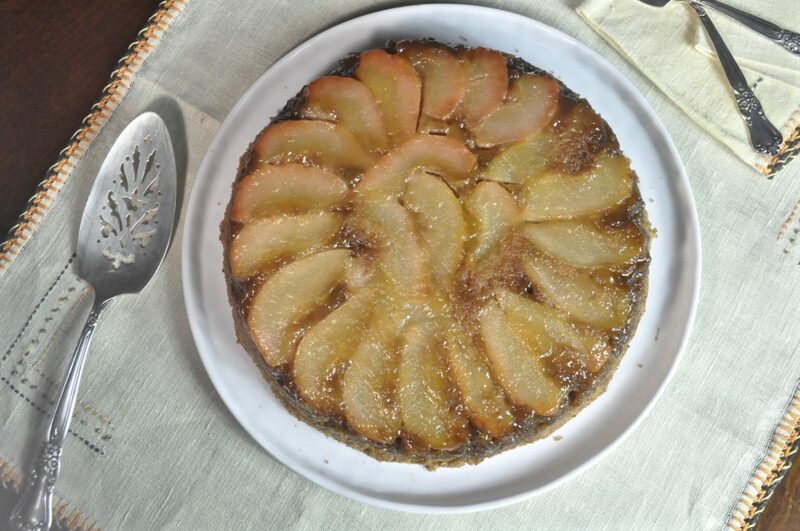 Pour batter evenly over pears (some pear may show through; cake will bake up over fruit). Bake until center of cake is set and bounces back when gently pressed and toothpick inserted in center comes out clean, 1 hour 10 minutes to 1¼ hours, rotating pan after 40 minutes. Let cake cool in pan on wire rack for 15 minutes. Carefully run paring knife or offset spatula around sides of pan. Invert cake onto wire rack set in rimmed baking sheet; discard parchment. Let cake cool for about 2 hours. Transfer to serving platter, cut into wedges, and serve.